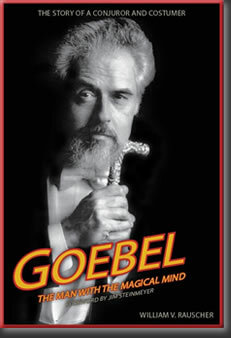 In the 1970s and 1980s George Goebel presented a grand, classical magic production called the Goebel Magical Revue. With a cast and staff of 35, he astonished lay audiences and received accolades from fellow magicians. Those shows wowed both Jim Steinmeyer and Lance Burton, each of whom contributed to this book. Goebel's life and career in Baltimore, Maryland, brought him into contact with countless magicians, including Milbourne Christopher, Hen Fetsch, Doug Henning and Phil Thomas. his knowledge of Howard Thurston, Thomas Chew Worthington III, Henry Ridgley Evans and magicians around the country is extensive. His A.T. JonesCostume Company has 300,000 costumes for musicals, plays and operas. It's housed in a three-story building, which also serves as a haven for some very unusual friends. Goebel's private collection of magic and escape restraints is exceptional. Goebel tells how he gained experience working with Milbourne Christopher on the Jackie Gleason and Gary Moore shows - assisting with the Vanishing Elephant plus rehearsals for Christopher's Bullet Catch. his remembrance of the Baltimore eccentric magician Dantini is illuminating and touching. Read about Goebel's escape work in Japan, Baltimore magic history and his detailed account of building and presenting a full evening magic show that included a 10-member dance ensemble under the leadership of a former Radio City Music Hall Rockette. Includes A Complimentary DVD - Approximately 206 Minutes Containing Segments of a 1980 and 1982 Goebel Show, Film Clips and News Interviews Plus Views Inside the Jones Costume Co. Published by Martinka & Co.
"Just got the book today! What a marvelous job you have done with it. I am sure George is thrilled and it looks like a sleepless night for me�up all night reading." "The Goebel book is truly one of the best�so full of surprises. I am proud to call Goebel my friend." "I am half way through it, and it�s a great story, well-written." Martin Preston who stars in his own show recreating Liberace and his music in Vegas and throughout the U.S.
"George Goebel is not only a fine magician and performer in the �classic stage magician� style, but he is also a real gentleman as well as a very generous person and friend." "By the 1970s, the era of the traveling full-evening magic show was virtually over. Changing tastes and venues no longer accommodated illusion revues in the Thurston and Blackstone style. A few veterans such as Virgil and Calvert soldiered on, and they were joined by Baltimore native George Goebel. Combining his talents as an illusionist, costumer, and escapist, Goebel treated audiences to an old-fashioned revue filled with dancers, animals, and strong magic. his show was especially well received by magicians, how felt that a grand era had been given a new jolt of life. As Jim Steinmeyer relates in his forward, seeing the Goebel show at Abbott's in 1971 was a revelation. For Gene Anderson, the revival of LeRoy's Three Graces illusion (which preceded Doug Henning's recreation) was "the finest magical moment I have ever witnessed." Lance Burton was yet another youngster whose imagination was set afire by Goebel's beautifully costumed and choreographed wonders. As the biographer of Calvert, Raymond, LeRoy and others, Bill Rauscher brings practiced research and an eye for a good story to this thorough profile. With many of Goebel's friends sharing their memories, and using the extensive records kept by the magician himself, Rauscher has captured the life of this warm and gentle showman in all its facets. it seems that no one has anything bad to say bout Goebel, now 78, a genuinely kind and generous an who deeply loves all things theatrical. Associated with the A.T. Jones Company for sixty years, Goebel has provided high-quality costumes for operas, local theaters, mascots, and even political events such as the annual Gridiron show. He is also an art connoisseur, a lover of animals, and a historian of magic with an enviable private collection. He has been married to his leading lady, Carol, for 53 years. But this book is more than a biography. It is also the story of magic in Baltimore, with profiles of the city's early magic organizations and a cast of characters that includes Kellar and Thurston, Milbourne Christopher, Dantini, McCarl Roberts, Hen Fetch, Phil Thomas, Walt Hudson, and Mark Walker. in addition, Rauscher gives a detailed history of the A.T. Jones Company, dating back to its founding in 1868. This legendary business is now home to the Goebel magic show, in storage admid thousands of Santa outfits, medieval helmets, and dresses from La Boheme. Never financially profitable, Goebel's Magical Revue was a labor of love that kept alive a rich tradition. So that readers can see the show in its prime, the accompanying DVD features a nearly two-hour 1982 performance in its entirety, as well as scenes from the 1980 IBM convention performance (put on against impossible odds) that sealed Goebel's reputation among his admiring peers. Parts of the show will seem dated now that three decades have passed, yet Goebel's charm and the impressive spectacle of it all are timeless. The DVD also contains lengthy behind-the-scenes footage, which helps viewers appreciate what it's like to rehearse in a costume shop at 90 degrees. A handful of other film clips and interviews make this DVD a fine companion to an engaging book. George Goebel is fortunate to count as a friend the scholarly Bill Rauscher, who has now place on permanent record the life and legacy of one of magic's true gentlemen." Michael Claxton for Magic, March 2011. "The first thought that popped into my head upon seeing this biography was, "George Goebel who?" My second thought was that, if Jim Steinmeyer wrote the book's forward, it was probably worth the read to find out. I was right. In the days of Kellar and Thurston, full evening magic shows were the norm. But times have changed and for several reasons (mostly economic) these shows are all but extinct. Bill Rauscher's biography tells the life of American illusionist, escape artist and costumer George Goebel and the genesis of his full evening illusion show, The Goebel Magical Review. With a cast and crew of thirty-five, Goebel's show was one of the last of its kind. From time to time, the book's focus shifts away to others in Goebel's sphere of influence. This includes mentors and role movels including Milbourne Christopher, and students like Mark Walker. This provides wonderful context, particularly for someone not well versed in the history - however recent - of stage magic and illusions. What makes the book particularly informative, and which may eventually place it on the "must-have" list of anyone interested in large-scale performances, is the level of detail Rauscher provides about preparing the show. There is insight into how individual illusions are acquired, renovated, choreographed and rehearsed. There is even a manifest for packing the show, all fifty-one crates of it. A three-house companion DVD is also included with the book. Among the footage are a few ancillary clips from rehearsals and TV performances, but the main focus is Goebel's full evening show in its entirety. The way magic is being marketed today, it is easy to imagine this DVD as its own separate release with a similar price tag to the book itself, but here, it's part of the package. In addition to being a fun read, the abundance of photos and ephemera, both black and white, and in color make the book an attractive offering.